Linear’s Multi-Door controllers can be used in traditional stand alone modes supporting up to 4 doors or gates. In addition, the multi-door controllers can be used to expand installations containing Linear’s Telephone Entry systems. 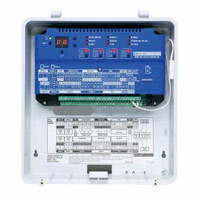 Up to 8 controllers, supporting up to 32 doors or gates, can be linked together via RS-485 to create a network. Linear’s AccessBase or AccessBase2000 software can then combine up to 8 networks to create a 64 controller network with up to 256 doors or gates. Direct input for 2 card readers; add AM-CRI’s for more.